Arranging the practicalities of the removal may seem a long way off now – you have the region to choose, the properties to look at, offers to make and mortgages to find, but it will come round soon enough and bring with it its own headaches. There are many removal companies vying for your business, some of whom offer an excellent service, others than provide the very minimum and plenty of others in between. If you are thinking of doing the removal yourself, there are a number of considerations to think of before you take that bold step. 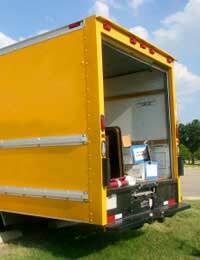 This may sound simple, but when you are actually faced with this task you will appreciate that there is a lot more to it than just packing up your stuff and putting it in a van. There will be some things that you definitely want to take and others than you may not need to. A good system to use is to go round the house with a pack of coloured stickers – using one colour for ‘take’, another colour for ‘sell’ and a third colour for ‘not sure’, you can start to get an idea of the cubic volume of the possessions you want to take. If you are organised, you can sell items that you do not plan to take and make some money to help with the removal cost. Internet auction sites are great for this, you could also go to a local car boot sale one weekend, or arrange a yard sale. It is very frustrating to leave this till the last minute and then either end up giving things away or leaving them behind. Be aware than it costs quite a lot of money to take your possessions to your new home. If you are moving from a house with a large garden to a town house, for example, there is no need to take your lawnmower and gardening equipment. Or you may have a large collection of encyclopaedias and you are moving to a small apartment. Think about what you need and don’t need, rather than just pacing everything up for the sake of it. A few days spent thinking about what will be of use to you will help in the long run. Now that you have sorted out what you want to take with you, you need to work out how much packing material you need. Buying good quality boxes, bubble wrap and tape will make the stressful packing process easier and will allow you to have peace of mind during the drive. This is especially important if you will not be able to unpack your items straightaway when you arrive, if the property needs some renovation, for example, as you can move the boxes around a number of times with the corners buckling and the goods inside getting damaged. There are many van hire companies on the internet and in the yellow pages but their services differ greatly. Set aside an afternoon to call round and get some quotes, making sure you have accurate information to hand. You will need to know the rough cubic volume of your boxes and the number of days you will need to van. Make sure to ask if they are happy for you to take the van outside of the UK and that there is no additional mileage charges, as these can really add up when you are driving through France and back. Now you have your possessions packed and the van booked, you will need to carefully pack the van. Damage is caused by the areas in between boxes moving when the vehicle is moving, so fill every little space with soft things likes towels, cushions and duvets.